Taiwan’s president Tsai In-wen will travel to North, Central and South America this month. Since her inauguration, China has put intense political pressure on Tsai Ing. In support of Taiwan’s claim to self-determination, she will seek to renew support from allies overseas. Taiwan, which has been ruled separately from China since the Chinese civil war in 1940, is dependent on international support to counter the pressure the from China both domestically and in international institutions. Taiwan’s president will travel to North, Central and South America this month to renew support from two of her government’s few remaining foreign allies and tighten informal ties with the United States, both steps crucial to resisting increased pressure from China. Taiwan President Tsai In-wen will leave Sunday [12 August 2018] for Paraguay, the only Taiwanese ally in South America, and the tiny Central American state of Belize. She is scheduled to stop in the western U.S. cities of Los Angeles and Houston for events that some expect to showcase the strength of Taiwan-U.S. ties. China has condemned the stopovers as it considers Taiwan part of its territory rather than a country entitled to diplomacy with Washington, which has formal ties with Beijing. Communist officials in Beijing have chipped away at Taiwan’s foreign relations since Tsai took office in 2016. They resent Tsai for declining to see her government and China’s as part of one country. “Simply making the trip is already a success because it means Washington is willing to take a small hit in its relations with China out of respect for Taiwan,” said Denny Roy, senior fellow at the East-West Center, a research organization in Honolulu. The United States is Taiwan’s strongest informal ally and chief arms supplier. Over the past half-year, relations have surged with a first step toward selling American submarine technology to Taiwan and the U.S. Congress’s Taiwan Travel Act that encourages more high-level visits. At the same time, trade disputes are straining Washington’s relations with Beijing. Those disputes make the U.S. government more likely to ignore Chinese opposition to stopovers by Taiwanese leaders, experts say. “Beijing’s problems with U.S. support for Taiwan are always amplified at moments when U.S.-China relations are unusually poor, such as now,” Roy said. Tsai will probably seek “a little bit more exposure” on this trip compared to in 2017, said Huang Kwei-bo, vice dean of the international affairs college at National Chengchi University in Taipei. It’s not clear whom she will meet in the United States, but any contacts with the government of President Donald Trump would raise Beijing’s anger. “You can’t rule out that D.C. would send some officials to meet her, but we wouldn’t necessarily be able to see,” Huang said. Taiwanese generally want their presidents to improve relations with major world powers, particularly Japan and the United States. Tsai’s party is now campaigning for votes in city and county elections set for November. 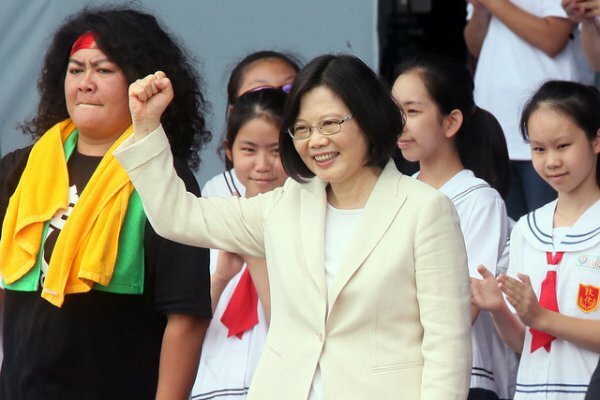 “Whether Tsai In-wen is going to deliberately keep this a low-profile issue, I doubt it, because honestly Beijing has been bullying Taiwan since her inauguration,” said Yun Sun, East Asia Program senior associate at the Stimson Center think tank in Washington. Trade issues have raised discontent in China about whether the Beijing government prematurely challenged “U.S. supremacy” before it was ready, Sun said. “On the issue of Taiwan, Beijing does not have as much leverage to fight back,” she said. ​In Paraguay from August 14-16 , Tsai will attend the inauguration of President-elect Mario Abdo Benitez, the foreign ministry in Taiwan says. Tsai also visited Paraguay in 2016 and hosted the country’s head of state in 2017. Tsai will stop too in Belize, an ally in Central America where Panama cut ties in 2017, angering much of Taiwan’s public. In that country from August 16-18, she is set to address the National Assembly and preside over an award ceremony for Taiwan Scholarship Program recipients.